This vehicle was the third and last TEP1 chassis and was delivered new to the City Coach Co in August 1938 as fleet number G1. City’s later Gnus were of chassis type TEC2. When new the Duple bodywork was in C40C lay-out. The vehicle was sold to a dealer in May 1948 and then re-sold to E Wright of Southend-on-Sea (trading as Grey Luxury Coaches) in the following month, becoming Wright’s fleet number 8. Wright withdrew it in June 1951 and it next appeared with Taylor of Caterham in May 1952 as fleet number 16. Taylor traded it in to the Arlington Motor Co dealership in November 1954 and by June 1956 it was reported to be with an "unidentified showman". Does anybody know when it was last licensed? I bought the original 10×8 print (which now hangs in my flat!) from a second-hand stall and have no idea who the original photographer was nor where the picture was taken. Can anybody identify the location? Ooh! 25 years or so before the Bedford VAL . . .
Four-wheel steering PSV’s were a very rare breed. The Leyland Gnu (supposed to have a silent G but that all stopped with Flanders & Swann’s song) was not only a rare beast with its four-wheel steering, but also with its set back front axle, like the Maudslay SF40/Magnum, but not looking so sleek. 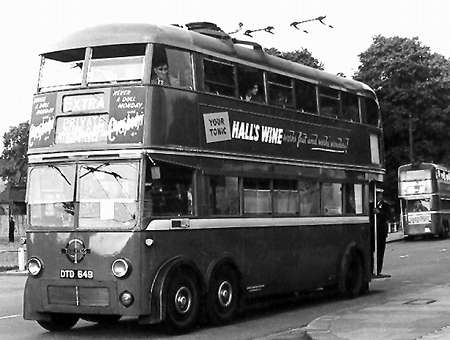 Another example was London Transport’s 1939 chassisless all-Leyland Class X7 four-wheel steering trolleybus 1671 (DTD 649) which was unique in the fleet and scrapped in 1955. It was conceived, and was successful at, reducing tyre-scrub problems on the conventional six-wheeled trolleys and considered to have light steering, but was not repeated. There were only ever three of the Gnu TEP1 built, the other two being 40 seat front-entrance saloons bodied by and operating for Walter Alexander & Sons Ltd. Unlike the later TEC2 which was a PSV conversion of the Steer TEC1 lorry, not only was there a substantial front overhang, but also the radiator (of Tiger pattern) was off-set to the nearside to allow the 8.6 litre engine to be mounted further forward to improve passenger access. The steering was not (unlike the VAL) power assisted. Interesting that the trolleybus has a Lancashire DTD registration. Was it originally a Leyland demonstrator? Not exactly, Philip. It was a one-off experiment with Leyland chassis and body to mimic LPTB’s trolleybus ‘house style’; a sort of demonstrator, but with LPTB very much in mind! This would not have been hard, as Leyland had built some London chassisless trolleybuses, to order, a year or two before. Electrical equipment was by Metrovick. It was run in London for about six months, then bought by LPTB, perhaps because, despite the war having started, trolleybus expansion was still running at pre-war levels in London and, with prescience, they wanted all they could get! Following on from Stephen A’s post, here are some photos of Gnu models painted in City and Alexander colours; all four sides. The page is slow to load, then go 1/3rd down the page. Some of those views mentioned by Chris Hebbron (29/03/16 – 11.50) have what look to be ‘Foden-ish’ front panels. Or are my eyes playing tricks again? Yes Pete, they are "Foden-ish" in their looks, but that’s the limit of it. There’s no Foden element in any of these Leylands. I suppose that a Foden designer might have seen them and worked on a similar design (or did someone working with pre-war Leyland transfer to Foden later?) But these are all fascinating buses and coaches. The images of the models in Chris H’s link is also interesting. It was worth comparing the dimensions of the NGT SE6 with those of the Leyland Gnu – two different pre-war approaches before Midland Red led the way with the under-floor engined S6 saloon in 1946 for the rest of the world to follow. Thanks for the above Michael, but I think it was a Duple designer who styled the front of the City TEC2s and not a Leyland one, Leyland Steer cabs of the time had an exposed radiator. The post war Leyland cab strongly resmbled the Ale3xander bodied Gnus however. Of course the Northern SE6 and SE4 were the work of Donald Sinclair who then became chief engineer at Midland Red. These postings do generate a lot of little-known information, don’t they? " . . . and informative copy" is a very apt motto! John- there is a Swedish coach company called Froggy Tours, and yes I have seen them in France, which uses Setra and Neoplan double-deck coaches with 4-axles three of which steer, I think. Seen with their luggage trailers, too, they are quite a rig! Michael H mentioned Midland Red’s S6 model, which made me plot the stages of moving bus engines from front to back of the vehicles, a feat which took from 1932 to 1950; a mere 28 years, certainly less had the war not intervened. John Rackham’s “Q” class vehicle first saw the light of day in September 1932 with the LGOC, with a vertical engine mounted behind the offside front wheel. This avoided the need for a high floor which later underfloor-engined vehicles suffered from. Nevertheless, apart from London Transport taking 233 single deckers and five double deckers, the remaining UK sales amounted to penny numbers. London’s had long lives, mostly going in 1952/53, many being sold on, even to Malta. Northern General’s first 30 foot long six-wheeler SE6 (later four-wheel LSE4), designed by G W Hayter (NGT Chief Engineer) & W G Allen, was was registered in 1934 and had a true underfloor engine. This was the first of 131 vehicles, of which 24 were the four wheel SE4’s. The Leyland Tiger FEC (LPTB’s TF class) had underfloor engines, the prototype being delivered in December 1937, with the remaining 87, delivered in 1939, but they were to to be purely destined for London Transport, although the war suppressed any opportunity to market them elsewhere. They were 27’ 6” long and seated 34, but these were Green Line/private hire vehicles. They were in store or used as ambulances, during the war up until 1946, when Green Line services resumed. Sound vehicles, the last, nevertheless, went in mid-1953, with low mileages, a victim of LT’s obsession with standardisation, using the RF. The Leyland Panda was produced after an enquiry by LPTB, who later lost interest, hence the vehicle entering service with Walter Alexander. The chassis had an underfloor engine, like the Leyland FEC. Alexander built the body, which had 45 seats and a centre entrance. Towards the end of the war, Midland Red R&D built some prototype chassis (S1-S5) chassis, designed to take a rear engine, but, with the arrival of Donald Sinclair, as chief engineer, from Northern General, (who oversaw the creation of the SE6/SE4), these chassis being altered to take an underfloor engine. The result was the S6, the first one of which was built in December 1946 and entering service in February 1947, the first of 100 vehicles. Again, they remained solely with Midland Red, being retired in the 1960’s. How these subsequent events might have changed, had a successful rear-engined vehicle emerged from S1-5! It was Sentinel who first offered an underfloor-engined vehicle to the open market, displaying two complete models at the Commercial Motor Show in 1948. For the first time, here was a model which could have transformed the then current thinking of the wider bus world, but, sadly, an outmoded, thirsty engine with high fuel consumption somewhat insecurely mounted underneath, with at least engine falling onto the road, somewhat dampened enthusiasm to buy – a tragedy really. Slightly later came the Leyland Olympic, introduced in 1949, a single-decker, with in integral body, under which was a horizontal version of the ubiquitous O.600 engine, with over 3,500 being built between 1949 and 1971. These rugged and reliable vehicles were exported around the world, proving very popular. The underfloor-engined bus had finally arrived! Then, in September 1950, Foden succeeded in producing the first rear-engined bus in the UK, the PVRF6, but it was not a big seller. 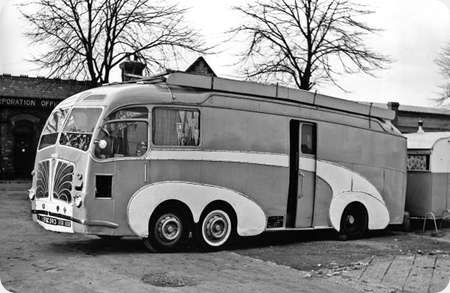 It was another eight years before Leyland launched the game-changing Atlantean at the 1958 Commercial Motor Show. The first rear-engined PSV was actually delivered in 1937 – the prototype Leyland REC (Rear-Engined Cub), London Transport’s CR class. 48 production examples followed. 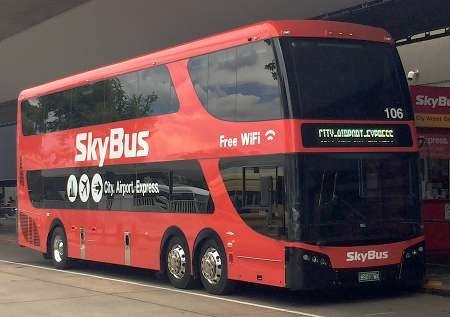 As Ian Smith astutely points out on his website, the concept was exactly the same as the Dennis Dart of 50 years later. The Tilling-Stevens Successor of 1937 was a true underfloor engined design, albeit one that failed, primarily because the horizontally opposed eight cylinder engine kept breaking its crankshafts. It is believed that neither of the two constructed ever ran with the eight cylinder engine, but what ultimately became of these remarkable chassis is shrouded in the mists of time. Thx Peter/Roger, for reminding me of my omissions, especially that of the CR’s, although I should have remembered the Successor, too, since there is my thread about LT1000’s second body, which was taken off the Successor’s chassis! When you consider that the late thirties relationship between LPTB and Leyland was so innovative, which, initially included the Panda, it surprises me that Leyland were so slow in marketing underfloor/rear-engined postwar. The CR was a little unreliable, true, but there was a war on before snags could be ironed out and these mainly surplus, unloved ‘babies’ after the war, were too small for ‘big boys’ work! Their "conversion" to underfloor engine (one wonders how much actually remained) was probably under consideration before the war and the arrival of Mr. D.M. Sinclair. Between 1941 and 1944, they appeared, one a year, as 40 seat buses, types S1, S2, S3 and S4 with mechanical and body variations. The S5 was completely new and differed in being of integral construction.